Kim has used the Surf's Up range from Bella Blvd to create this great beach themed layout. Although the range has includes pink throughout, Kim says it was very easy to create a layout with no pink at all (since it featured her son and father-in-law). Kim loves the Bella Blvd paper tapes and used them to create a one of a kind border on this layout by layering a variety of different tapes. Kim says she particularly likes Bella Blvd paper tapes as they are a heavier weight than washi tape and can be removed and restuck easily. These bright funky papers are fantastic to make a hip looking wedding card!! Jane stuck a cute little flag in one of the chipboard icon stickers, cut a sentiment from the vows paper and layered that on the card with some Washi tape. When Jane popped out the letters from the chipboard icon sheet she loved the look that remained, so she just had to make a card with it!! She trim it and back it with the cloud paper, inserted a flag inside the ‘W’ and glued a couple within the ‘D’ section. We’re big fans of the double layout here, and this one by Diane Payne can’t help but make us smile. She has used the appropriately titled Sunshine and Happiness collection to create this double page with sequential photos. 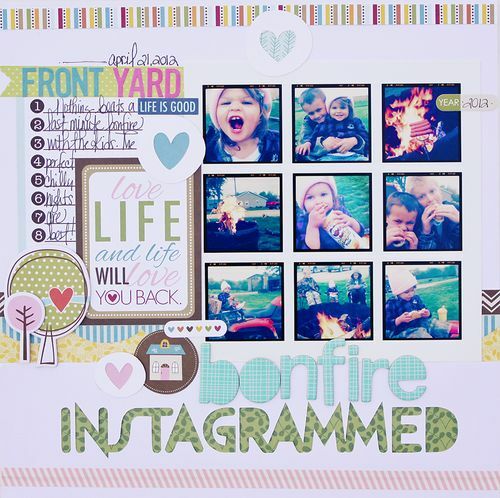 How sweet indeed is this layout by the talented Malika Kelly. She has used a mixture of collections to create the random pattern on this page, and notes how easy it is to mix and match the Bella Blvd ranges and still achieve harmony. We loved the green and blue tones on the strong dark cardstock base in this gorgeous layout by Bella Blvd DT member Megan Klauer. She says that the inspiration came from some of the Designer Tapes which were just bunched together in a basket.. a happy accident that created a striking page. Finally these wonderfully happy cards were created by Gretchen McElveen. We love her colour palette and the use of the pale greys from the Love & Marriage line that makes the brighter colours pop. The Winter Wonderland collection from Bella BLVD is the perfect collection for scrapping your snow or winter themed photos. Sue Tonga has made use of the papers and stickers from the collection and has added in the delightful wooden snowflake buttons, the flags and chipboard lettering. Snowflake transparency from Hambly, glitter cardstock from American Crafts and a few white sequins add the pretty glittery touches. Kim has made this bright and happy birthday layout with the Bella Blvd Birthday Boy range. By using small size photos (3x2 inch), Kim has been able to include seven photos covering the highlights of the party - and the bright bold colours and embellishments in this range are perfect for recording the story. 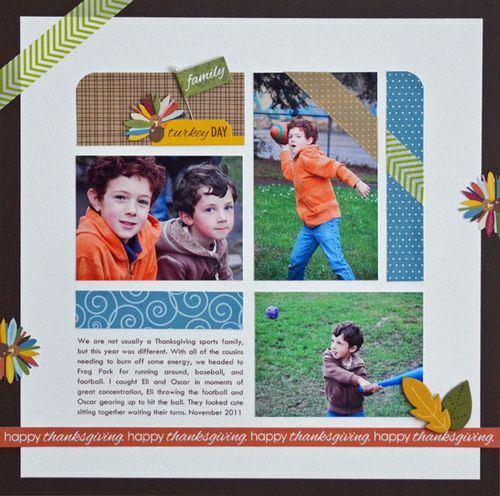 We loved this clean graphic approach to the Thankful collection by Bella BLvd DT Member Vivian Masket. Her judicious use of embellishments and washi tape add just enough interest to make this layout shine. How fun is this page of Instagram photos by Megan Klauer. She’s managed to get a lot into this page without it seeming at all cramped – there’s an art to that! Kathy Martin created this cute card set using the Bella Blvd Designer Tapes. The tapes are fun with cool patterns and bright colours. Kathy added strips of the Designer Tape to clear vellum and then used a die cutting machine to cut shapes. Of course, you can use punches too. What a great idea. Thanks Kathy for allowing us to share your gorgeous cards. Three new ranges from Bella Blvd – an autumnal toned and themed Thankful Collection, and one each for Birthday Boys and Girls. Bella Blvd is so bright just like a rainbow! Leeann had so much fun in creating this page. She really made those papers pop by using it against the white cardstock. Leeann has used the Sunshine and Happiness paper collection, journaling stickers, miniatures and buttons from the button market. Leeann could not stop at one page and decide to whip up another. She adores this picture of Jorja colouring. Here she used the Bella Blvd chevron washi tape to create a quick and simple border. She made a few banners from patterned papers and journaling spots. simply layered them and added a few of the miniature tags. She finished this page of with those market buttons which she totally adores. Iris had so much fun creating this layout of her daughter playing with clay on a warm summer afternoon at the park. The Bella Boulevard papers and embellishments were a perfect complement to the colourful world of a child. She only used stickers here and embellishments and was still able to complete the look of the page. She used a mistable paper as base and applied pastel colours to create a colourful base for the stickers and embellishments.The edges were then texturized with texture paste and coloured again with pastel colours, paint, and gold metallic pigments. The Bella Blvd collection doesn't have to be all about baby creations. Here Chris has decorated one of the new Jenni Bowlin Chalkboard Easels for her daughters bedroom. Chris fussy cut around the cupcake image and used 3D foam tape to adhere it to the chalkboard. She also did the same with the stickers from the Baby Girl miniature stickers and formed them into a garland. The chalkboard easel comes with it's own chalk pencil for writing reminders or little notes on the board. You could be forgiven for thinking that the background of this card was stamped, but alas, it is the gorgeous pattern paper from the Bella Blvd Baby Girl collection. So soft, pretty and easy to create with! Chris fussy cut around the elephant image and added one of the divine crochet flowers embellishments to the image. Chris saw this cute little monkey image in the Baby Girl collection kit but didn't want to fussy cut around the edges of the image, so the solution was to use the Sizzix fancy label die cut to cut around the main parts of the image and create this adorable baby girl card. Chris found it hard to stop creating cards with the Baby Girl Collection. This time she also combined the papers and stickers with some twine from Jillibean Soup. This bright and funky page was created by Kim Watson. You can see her published frequently in magazines and craft books and this page with it's crisp lines and rich details show us why her pages are loved by so many. This page was one of her creations for her guest designer spot at Bella Boulevard. Our very own Kim Arnold is also a design team member For Bella Blvd and she jumped at the chance to share these gorgeous layouts using the Baby Boy range with our readers! Kim says that the chipboard icons in this range are super cute and along with the papers are a match made in heaven - such a versatile collection. Kathy Martin is a design team member for Bella Blvd and has created three very gorgeous cards. We adore how happy and bright they are. Thank you so much Kathy for letting us share some of your cards. Lia Abdulah created this masterpiece of a monogram for the product swap and blog hop of Bella Boulevard and Maya Road. She created fun and colorful embellishments with the Bella Boulevard Papers and came up with a design that will cheer up and corner of the room. We’re thrilled to announce that at CHA last month we were appointed as distributors for Bella Blvd. As you can see from their releases below they have clean, bright designs and innovative embellishments and we’re excited about bringing their products to you!